Whites Contribute More To Air Pollution — Minorities Bear The Burden : Shots - Health News Blacks and Hispanics are exposed to higher levels of air pollution than whites, yet whites consume more of the goods and services that cause it, according to new research. 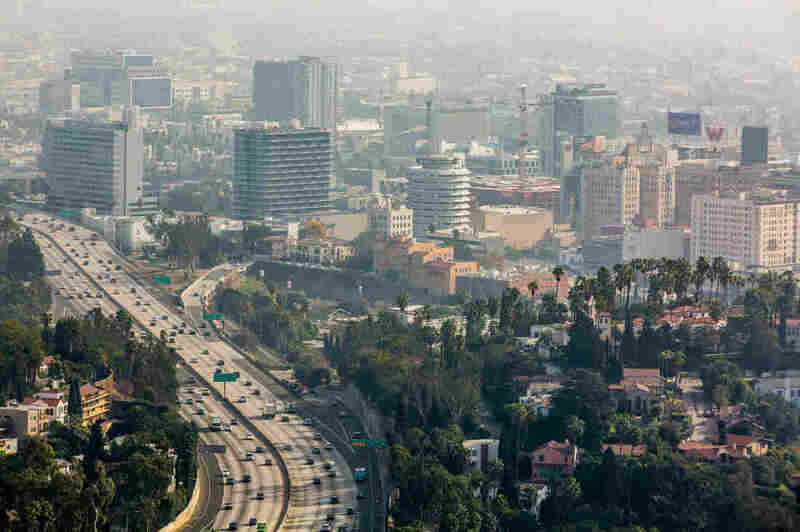 An elevated view of smog and air pollution in Hollywood, Los Angeles, California, USA. A study published Monday in the journal PNAS adds a new twist to the pollution problem by looking at consumption. While we tend to think of factories or power plants as the source of pollution, those polluters wouldn't exist without consumer demand for their products. The researchers found that air pollution is disproportionately caused by white Americans' consumption of goods and services, but disproportionately inhaled by black and Hispanic Americans. "This paper is exciting and really quite novel," says Anjum Hajat, an epidemiologist at the University of Washington who was not involved in the study. "Inequity in exposure to air pollution is well documented, but this study brings in the consumption angle." Hajat says the study reveals an inherent unfairness: "If you're contributing less to the problem, why do you have to suffer more from it?" The study, led by engineering professor Jason Hill at the University of Minnesota, took over six years to complete. According to the paper's first author Christopher Tessum, a postdoctoral researcher at the University of Washington, the idea stemmed from a question at a conference. Tessum presented earlier research on how blacks and Hispanics are often more exposed to air pollutants than whites. After he finished, someone asked "if it would be possible to connect exposure to air pollution to who is doing the actual consuming," says Tessum. According to Tessum, no one had ever tried to answer that question. It's a big, complicated issue, but studying it could address a fundamental question: Are those who produce pollution, through their consumption of goods and services, fairly sharing in the costs? For any given area in the U.S., the researchers would need to know how polluted the air was, what communities were exposed to pollution, and the health effects of that level of exposure. Then, for the same area the researchers would need to identify the sources of that exposure (coal plants, factories, agriculture to name a few), and get a sense of what goods and services stem from those emissions (electricity, transportation, food). Finally, whose consumption of goods and services drives those sectors of the economy? "The different kinds of data, by themselves, aren't that complicated," says Tessum. "It's linking them where things get a little trickier." The most relevant air pollutant metric for human health is "particulate matter 2.5" or PM2.5. It represents the largest environmental health risk factor in the United States with higher levels linked to more cardiovascular problems, respiratory illness, diabetes and even birth defects. PM2.5 pollution is mostly caused by human activities, like burning fossil fuels or agriculture. The EPA collects these data through the National Emissions Inventory, which collates emissions from specific emitters, like coal plants or factories, measures of mobile polluters like cars or planes, and natural events like wildfires, painting a detailed picture of pollution across the U.S. The researchers generated maps of where different emitters, like agriculture or construction, caused PM2.5 pollution. Coal plants produced pockets of pollution in West Virginia and Pennsylvania, while agricultural emissions were concentrated in the Midwest and California's central valley. "We then tied in census data to understand where different racial-ethnic groups live to understand exposure patterns," says Hill. Tessum then used previous research on the health effects of different exposure levels to estimate how many premature deaths per year (out of an estimated 102,000 from domestic human-caused emissions) could be linked to each emitter. "We wanted to take this study further by ascribing responsibility of these premature deaths to different sectors [of the economy], and ultimately to the consumers, and maybe consumers of different racial and ethnic groups," says Hill. To do that, the researchers actually worked backwards, following consumer spending to different sectors of the economy, and then ultimately to the main emitters of air pollution. Consider one major contributor to emissions: agriculture. Consumer expenditure surveys from the Bureau of Labor Statistics provide detailed data on how much money households spend in various sectors of the economy, including food. These data gave the researchers an idea of how much blacks, Hispanics, and whites spend on food per year. Other expenditures, like energy or entertainment, are also measured. Taken together these data represent the consumption patterns of the three groups. To translate dollars spent on food into air pollution levels, the researchers traced money through the economy. Using data from the Bureau of Economic Analysis, the researchers can estimate, for example, how much grocery stores or restaurants spend on food. Eventually, these dollars are linked back to the primary emitters — the farms growing the food or the fuel that farmers buy to run their tractors. The researchers have now completed the causal chain, from dollars spent at the grocery store, to the amount of pollution emitted into the atmosphere. Completing this chain for each source of pollution revealed whose consumption drives air pollution, and who suffers from it. "These patterns didn't seem to be driven by different kinds of consumption," says Tessum, "but different overall levels." In other words, whites were just consuming disproportionately more of the same kinds of goods and services resulting in air pollution than minority communities. "These results, as striking as they are, aren't really surprising," says Ana Diez Roux, an epidemiologist at Drexel University who was not involved in the study. "But it's really interesting to see consumption patterns rigorously documented suggesting that minority communities are exposed to pollution that they bear less responsibility for." Diez Roux thinks this is a good first step. "They certainly make assumptions in their analysis that might be questioned down the line, but I doubt that the overall pattern they found will change," she says. Tessum points to some hopeful results from the study. PM2.5 exposure by all groups has fallen by about 50 percent from 2002 to 2015, driven in part by regulation and population movement away from polluted areas. But the inequity remains mostly unchanged. While more research is needed to fully understand these differences, the results of this study raise questions about how to address these inequities. Tessum stresses that "we're not saying that we should take away white people's money, or that people shouldn't be able to spend money." He suggests continuing to strive to make economic activity and consumption less polluting could be a way to manage and lessen the inequities. Diez Roux thinks that stronger measures may be necessary. "If want to ameliorate this inequity, we may need to rethink how we build our cities and how they grow, our dependence on automobile transportation," says Diez Roux. "These are hard things we have to consider."